Sectors: Base 10 - Each sector is exactly 10 levels above the next. Encounter zones capped at 100 for highest dungeon(s). Sectors: Warlock - Level progression in sectors aimed to cater to those who want to start in the mage's guild. Sectors: Lives We Lived - An attempt to make the Live Another Life mod more compatible (at least the 'escaping from this cell' bit). Sectors: Sunshadow - A more friendly leveling scheme for players withing to contract Vampirism and run the Dawnguard questline sooner rather than later. As there are virtually limitless combinations, feel free to create your own versions to post (please follow permissions if you use my work), suggest other variants, or vote on your favorite idea so I know what to work on next. Is this compatible with other mods that increase enemy difficulties? Such as sturdy dragons? Yupp! This only changes encounter zones and enemy scaling. At worst, it will make that one dragon fight a bit harder than before. multiple mods that change encounter zones will cause enemies to become level 1. I'm disinclined to agree--the overwrite principle will come into play and one encounter zone mod will overwrite the other (so using multiple of these types of mods makes no sense anyway). A level 1 enemy would only occur if the overwriting mod allows a level 1 enemy or if your scaling mod changes max enemy level. There is also a rare interaction where an encounter zone is set to 10, but a script or spawn point calls in an NPC that is a lower level and cannot scale. In that case, the enemy will spawn in as the lower level. I use this interaction by mixing my Advanced Organized High Level SkyTweak Encounters Patch with sectors so that certain animals cannot exceed a certain level (prey spiecies cannot go over level 3 with minor exceptions). Also, this post was referring to mods such as AAE that changes enemy difficulty (ie perk scaling/levels/leveled weapons/etc). Enemy spawns as level 40. Yeah.... How do i fix that? Dunno. But seeing as I and the other users do not have this issue, I imagine it's a mod conflict in your game due to your load order. Why this patch is last on your load order is also confusing as it would be loaded earlier than last due to LOOT. In an ideal setup it would not even be *ON* the load order due to Wryebash combining it into a bashed patch. Either way, this patch will not cause that issue, as all it does it tell the game to: make this area have this minimum level, and another area to have another minimum level. Feel free to load this patch up on xEdit if you do not believe me. As a side note that should be common sense, and as mentioned in the descript: if you loaded this mid-game you will need to re-spawn your cells for it to take effect. This is the only thing I can imagine being the issue, which again, would not be related to this patch (user error). Are you aware that the map in your images says "Rorickstead" instead of "Rorikstead"? Does this pertain to the mod? Oh wow, this does sound well thought-out. Also reminds me of the only MMO I've ever played (City of Heroes), where you'd be absolutely dead if you entered an area that is more than 5 levels above you. Loved it, and would like to try out a similar system in Skyrim. I've never used any de-leveling mods for the exact same reason you stated -that you very quickly level beyond any challenge the mod has to offer- but your system sound like it could actually work if you don't introduce a max level. If I understood that right, enemies in Falkreath will still scale with your level even if you're like lvl100? How do you achieve that, because in the Vanilla game this isn't usually the case (with many enemies capping at lvl30 or 50)? Do you remove level caps for enemy types or are we going to need other mods for that (the description indicates that but I'm asking just to be sure)? The only caveat (apart from having to find a different way to play with Ordinator, which won't ever leave my mod list again because it's the only viable way I've found so far to play specialized characters without having the need to expand into atypical branches; I'm still lvl70 after 193 hours because my warrior only needs 4-5 different perk trees) I have is that this mod pretty much determines the order in which you play the holds, which might not suit every playstyle. 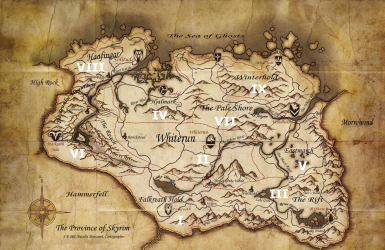 To illustrate: I start the game the regular way via Helgen and Alduin, then do Falkreath, then Whiterun, and so on along the main quest (the order of difficulty mostly represents the main quest locations, doesn't it?) - everything's fine. But what if I use LAL to mostly ignore the main quest (like in my current playthrough, where I started as a Stormcloak soldier)? I'd still be forced to go through the holds in the order the mod forces on me. SO my question is this: How much time did it take you to set this up? I'm not asking you to make a million different versions for every possible playstyle (although of course some customization options would be absolutely fantastic, either via installer or MCM once that becomes available for SSE), I'm just asking how long it would take me to set up a new playthrough with a specific vision in terms of role-playing and character build (i.e. a specific LAL role and therefore starting location) by taking your mod and editing the encounter zones for my own use. Edit: Just had a look at the ESP in SSEEdit. Since you've already gone to the trouble of looking up all the locations, I think changing it to fit whatever playthrough I'm planning shouldn't take too long (like, maybe an hour). THANK YOU for making this!! I changed the leveled enemies spawn so that random;y spawned enemies will spawn at your level or greater (up to 1.75x your level). As this is using Skyrim's base mechanics, once it cannot spawn a higher enemy, you'll be getting dragur deathlords ad infinitum. I made this as lightweight as possible for multiple reasons, but did not feel the need to make higher-leveled enemy mods when many authors have already done so. Basically, while it works out of the box, it has many limitations if you use it as your only mod. My thoughts were, as most people have mods already, I'll make something which enhances game-play and yet, can be merged with wrybash so they can use the mod slot for a higher-leveled enemies mod. As noted on the description, right after the red and yellow note/warning: this mod has its limitations. That, unfortunately, is one of them. I also realised that (as I am also a LAL user) many options of escape are out. Breaking out of the cell would be quite interesting, now, as eastmarch is level 55... Personally I usually enjoy a sneak ranger who dabbles in magic for conjuration, alteration and restoration. For any Skyrim vet who plays with difficulty mods, it is for obvious reasons. Unfortunately, ebonyflesh can only be found in random loot, or at the college of winterhold. If I wanted to get it in any sure way, I'd have to cart over, hope a dragon doesn't spawn, buy it, and either teleport back to safety or stock up on stamina potions. There are many ways to have leveled this, I chose this order in two parts, snowy areas are harder/harsher (works with Frostfall) and the reason I gave about Helgan being in Falkreath... The rest was whatever I felt like and to try to prevent side-by side sectors from having sequential levels--If you accidentally crossed the boarder, I wanted you to feel it. It does not actually follow the main quest, otherwise Haafingar would definitely not be base level of 76. (Thalmor embassy). Its' meant for people to explore and earn the right to quest in a new area. Concerning Ordinator, its the same for me. Only, I changed "energy shield" perk to "Elysian Shield" perk since I play on legendary and half of my mods are difficulty mods. High requirements to get, but: negates 40% of incoming damage at the cost of 35% magicka. Stunted magicka in combat, does not function with 0 magicka. I was going to lessen the requirements of it with my sectors playthrough--with difficulty like this, that's not OP. I have that and still get 1-shot with ebonyflesh, 100 smithing and enchanting dragonscale, and 500 health. Mages' lighting is a death sentence. Feel free to edit the encounter zones and post. Just give credit, list the zones in a fancy map (and preferably a small description on start to end premise), and I'll link it. It took me several days or research and developing modifiers, deciding on level mins, and finding stuff in general (I wanted to be thorough) to get everything down, but once I had the framework, I was editing the levels relatively quickly. Wiki a place, see main enemy type, look at hold for the base number, apply modifier, add random element, type level. Using mine as a base, and just changing the numbers (3 becomes 5, 5 becomes 2, etc. You can probably do it in an hour or less. Since my levels arent' by 10's, it won't quite be exact--just forewarning). Personally, I plan on adding a few more variants (actual ones, not just DLC-dependent) to this at some point, but play before more work for me. Oh wow, thanks for the in-depth reply! As for the Draugr Deathlords ad infinitum, I figured it'd be that way, but I also think you're going about this the right way. If I want high level enemies, I get the mod with that exact name and use it together with yours - perfect. I'm still waiting for SKSE to come out for SSE before I start my next playthrough (I want to start fresh with all features available on my new laptop that has that sweet GTX1070), but when I do I'll definitely use your mod and tailor the encounter zones according to my roleplaying choice. I can send/link you the ESP so you can include it here as an optional file, if you want, no need for me to "steal" your idea and upload it as my own (since the alternate ESP would be standalone). Edit: Oh wow, I just started two posts in a row with "oh wow." Guess I'm easily wowed. Hahaha, all is well. Personally I only ran through the main quest once, but leveled up high many times, and that's what it always comes down to. Suldafn was.... interesting? Personally, I found navigating that harder than killing Alduin--it was just 5 bajillion deathlords. Nowadays, I have High level enemies, Advanced Enemy encounters, and a whole slew of other mods. I'm considering dropping the difficulty a bit but then dragons are too easy, etc. etc. It's a no-win either way. I was thinking along the lines of SKSE as well, however, I imagine a lot of the mods will take a while to bugfix, so I was planning on restarting soonish and finding/downloading the mods, sitting on them a bit, then resetting again. I'll probably even make a new cutout of Sectors then. I'm liking the idea of a mages variant where Winterhold starts as easy, and Mzulft (out of necessity) is lower leveled than the rest... or just changing the ruins; going along the idea "these things are old and rusted, so fall apart easily." We'll see. I wonder, would it work to have a rather simple and straightforward "High Level Enemy" mod that simply uncaps all enemy types but instead governs their difficulty exclusively via the level multiplier? Meaning that regular Draugr can still level up to lvl90 if the player has that level, except thanks to the multiplier for an easy enemy, its de-facto level is, say, 60 (if easy means 2/3 of PC level)? Because the one thing I fear the raised minimum levels might do (though I might be wrong) is to just have the top tier enemy type for EVERY enemy that spawns, i.e. a Bandit camp with only Bandit Chiefs, which kinda ruins the whole "chief" hierarchy thing. Or is that not how the game works anyway? I'm not sure, only just begun testing this mod on my current playthrough (where I'm lvl71), and so far I haven't gotten to a Vanilla dungeon yet. xD If this isn't a concern anyway then there's no need to act, but I would be loathe to have boss-only encounters starting at lvl50-70. Skyrim --> Spawn 1 hard boss, 2 easy bandits, 1 very hard bandit mage. (In reality, it would be closer to 1 hard boss, 2 easy bandits from list, 1 very hard bandit from list... but you get the point). If you didn't have the uncapping mod, you'd likely just get the level-capped enemies of the same variety. Either way, it shouldn't make everything a boss. That said, I'm using "High Level Enemies SSE" so for me it would likely spawn in the appropriately leveled enemies that fit the scale. The reason you get dragur deathlord ad infinium is because the dragur death overlord and [unnamed] dragon priests are the "boss" enemies for that list. The regular deathlord is considered the top normal enemy, I believe (the boss list likely has a 'boss variant' of the regular deathlord for lower levels). Then again, I could be wrong, as I haven't studied the system 100%, and the priest may be a special boss or what have you. Just based on my own play-throughs and experiences, I believe the above is correct. If you really wanted to find out, however: You can make a hard save, find and enter a small cell (like Anises cabin basement), set game time to something outrageously fast and wait a few seconds, or use the wait function until your game's reset time (Mine is currently 36 hours regular, 120 for cleared--I believe the regular is 7 days normal, 30 days cleared). Then change the game time back to your standard, and go and explore a newly reset area. Basically, that is an accurate assessment. A nordic tomb in haafingar will look the same as in winterhold unless you have a mod to compensate for it (dragur deathlord fest). High level enemies and Advanced Adversary encounters does this magnificently. AAE is a larger overhaul, whereas the high level enemies + scaling is the perfect counterpart to this mod.If you made an uncapper that just uncapped, that would fit even better with the lightweight overhaul theme I was going for, as HLE still adds new records to the game. Note: the limitations of a super lightweight overhaul. I'm interested in your future Base 10 version. I'm hoping for a version in which low level areas like Falkreath will only spawn low-level monsters, so that I can overlevel an area before moving on. That would be more of a Diablo-style progression. Update from in-game experience: Apparently the mod DOES do something, especially in conjunction with High Level Enemies. Yesterday I did Ustengrav (at lvl72 ... I'm veeeeery slow with the main quest), and boy was that tough. A lot tougher than before I installed Sectors (and therefore only had HLE). My concern about lack of variety doesn't apply either as I got at least 3-4 different enemy tiers for each type (bandits/warlocks, draugr). So I'm not going to do the uncapper if that's already covered very well by an existing mod. Re: base 10 -- The only reason I scrapped that idea (it was my first one) was because overleveling could be very easily achieved in one sector. As you notice, gaps between max levels lessen as numbers grow higher. I also wanted to encourage exploring in the hold so they may be even more levels than 1-3 misc quests would provide. Re: Unleveler -- with High level enemies, this mod wroks very well as I have said. my mod sets a minimum level like I said, and also scales enemy encounters. If you are level 50, and go back to Falkreath, enemies will be (minimum) level 50. That is because I also edited area spawn parameters. The easiest enemy you will face (if the enemy subgroup has the correct level) is 1.0x your level. Hard is exactly what this was meant to do, and it was also meant to keep it that way. Re: Diablo-sty---Incoming mod release. Be on the lookout for TruSectors. TruSectors - Legendary Capped Skyrim Now Live. http://www.nexusmods.com/skyrimspecialedition/mods/8666/? Alsom bugfixes and Sectors (original) base 10 uploaded shortly. Thanks for the new TruSectors. I have downloaded it. I'm in the middle of a different playthrough, but will test it out soon. This is really interesting. I'm curious to see how it works with this stupid Skyrim quest UPS system (that makes you travel from Markarth to Riften between two quests objectives, for example)... But yeah, I'll give it a try for sure ! I was thinking the same thing. But I believe this might make things VERY interesting. I pity the first-time Skyrim player who uses this and then accidentally starts the Sanguine quest and suddenly finds himself in Markarth at lvl20 ... (But then again, I don't think first-timers are going to use a mod like this). This is going to have such a huge impact on how to play the game. Might consider changing Dwemer gear to make it top-tier armor and weapons if you're only going to get Dwemer crafting materials en masse at lvl80+ (although of course you'll still find the armors and weapons at lower levels). This... is exactly why I made this mod. I got bored of the normal unleveled. I got annoyed with the game because the only time I ever explored was when I did radiant quests (hint hint on how to level in the sector). It also adds a real progression to the game where you graduate from one to the next. And yes, smiting and enchanting become big players. Mining to get the levels up is now a must. Dwarven armor would be great if you had ancient knowledge... but Dwemer ruins are level 85. I kind of blocked that path for most people so there isn't an endgame set at the beginning. That, and seriously, shooting a ball of metal with an arrow and killing it... isn't that realistic. Basically, I kind of wanted to make an overhaul of Skyrim. And I did it in a merge-able .esp format for all to enjoy, without adding anything... Though it only gets better if you do. I realize I neglected those who don't use Dawnguard/Dragonborn (but why?) so I'll upload variants probably by weeks end. I'm currently enjoying the fruits of my labor. I think DG and DB are included baseline with SSE. Anyway I'm definately gonna try it, this is the kind of mods that makes me want to start a new game (such as Ordinator and stuff that changes you character progression). It may be included, but that doen't mean everyone has the esp's activated. Someone may just really dislike vampire lords. Or, another way to think of it, they want the base sectors experience, with the rest of the map more vanilla. The ability to run Dawnguard at level 10 and not die every second would be one benefit of not having sectors controlling DLC1 encounter zones. Cheers! hope you enjoy and feel free to leave feedback. I'll be starting a new game probably by week's end? I'm still fixing up some esp's and modding mods.... I've freed up probably around 30 slots already in anticipation for SKSE, and of course, more regular mods as well. I wouldn't worry too much about different versions for non-DLC players. Firstly, I think there aren't very many of those, and secondly, there are already mods out there that let you basically ignore the DLC as much as possible (e.g. Dawnguard Delayed and Dragonborn Delayed with various custom settings). True, though removing it would be more for allowing lower levels to access the areas. Also, to simply remove the dlc's, all I have to do is delete the DLC(X) entries from the leveled list, and then the appropriate master file... Would literally take less time than it took me to write this. I'm just lazy now. Cheers! One of my pet peeves is actually the whole "download and find out what my mod does". I don't download unknown files and hope they are okay. I don't expect others to do so with my files either. Sounds good. I'll test this. Perhaps now I can finally to go adventuring with party of companions without of being overpowering (I need my haulers). The best and most memorable moments I have had in this game have been when I have encountered overpowering enemy and beated it after some trying with optimal tactics. I definitely recommend getting higher level enemy mods and my new standby--advanced enemy encounters. They will definitely spice up your game and give you more of that run for your money. This was made to work alongside mods like those--it's a very lightweight overhaul.